By Daniel Horowitz--Less than 24 hours after four people were killed during a shooting at the Jewish Museum in Brussels, approximately 20,000 people, in solidarity with Israel, including a huge gathering from the Jewish community and others representing the diversity of the GTA, took part in Sunday’s UJA Walk with Israel. 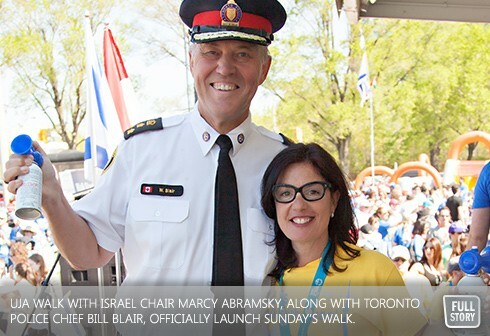 The Walk, which celebrates Israel’s accomplishments and contributions to the world-at-large, as well as Jewish life in Toronto, raised over $900,000 for social services and educational initiatives throughout Israel, while attracting political leaders and representatives from across Canada’s full political spectrum. Bringing greetings to the crowd of 20,000 just before Walk Chair Marcy Abramsky, along with Toronto Police Chief Bill Blair sounded air horns to officially launch the Walk, were The Honourable Joe Oliver, MP minister of Finance, Eric Hoskins MPP St. Paul's, Tim Hudak Leader of the Ontario PC Party and James Pasternak Toronto City Councillor. Over 35 federal, provincial and municipal elected officials and candidates for office were among the dignitaries who made their way to Coronation Park prior to the Walk kick-off, including: Canada's Minister of Finance, The Honourable Joe Oliver; MP Mark Adler; MP Carolyn Bennett; MP John Carmichael; MP Ted Opitz; MP Judy Sgro; Leader of Ontario PC party Tim Hudak; MPP Mike Colle; MPP Eric Hoskins; MPP Monte Kwinter; MPP Gila Martow; MPP David Zimmer; Toronto Councillor John Parker; Toronto Councillor Joe Mihevc; Toronto Councillor Josh Matlow; Toronto Councillor James Pasternak; Toronto Councillor Jaye Robinson; Toronto Councillor Karen Stintz; Vaughan Councillor Alan Shefman; Vaughan Councillor Deb Schulte; Vaughan Councillor Sandra Yeung Racco and Markham Councillor Howard Shore. With those inspiring words energizing them, the 20,000 Walkers left Coronation Park for the 8-kilometre Walk, Israeli and Canadian flags in hand, which transformed the streets of downtown Toronto into a veritable sea of blue and white, and red.